We’ve been waiting almost three months for a replacement part for our Cybex Arc Trainer (first it was back-ordered, now it’s stuck at Canadian customs). Most of the year, Mr. GeoK works-out almost every day and this cross-training cardio equipment is central to his exercise program. It’s not such a big deal over the summer when we’re out mountain biking, hiking and walking in the Canadian Rockies just about every day. But now that school’s back in session and we’re tied to a more regimented schedule, he’s missing his work-outs. So on Tuesday, with the weather forecast looking fine, we hopped on our bikes out to calm his craving for exercise! In the past, we’ve limited our use of on-street bike lanes. K is still young enough that there’s considerable room for him to improve his situational awareness when riding on the streets. But since he was in school, the rest of us decided to ride from home (in Signal Hill) to North Glenmore Park, where we accessed Calgary’s River Pathway system to ride south to Fish Creek Provincial Park. 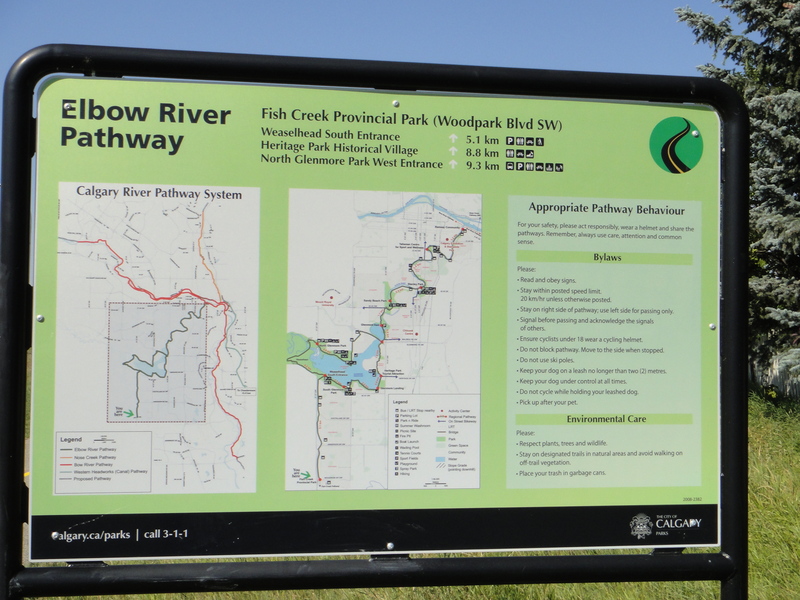 It was a surprise to learn this section of Calgary’s pathway system is considered part of the Elbow River Pathway. 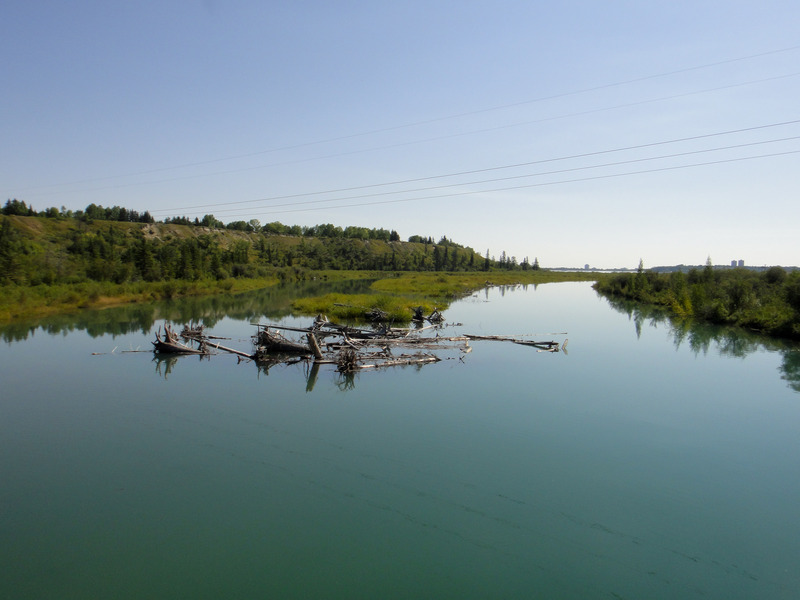 The Elbow River does “flow through” Glenmore Reservoir, and our route did include the delta where the Elbow empties into Glenmore Reservoir, but most of our ride was well south of the Reservoir, not at all proximate to the Elbow River. A closer look at the map reveals this is the south end of one leg of Calgary’s River Pathway System. This leg circumnavigates the Reservoir and then heads northeast along the Elbow River, so maybe that explains why this section is labelled part of the Elbow River Pathway. We pedaled just over 40 km by the time we returned home. Most of the trail is relatively flat, so our total elevation gain was just over 300 meters (most of that is due to the hills down into and up out of the Weaselhead and the hill going into / coming back out of Fish Creek Provincial Park). Flowing through a series of oxbows as it drains into the Glenmore Reservoir, the Elbow River was as smooth as glass this morning. Since the water level is still very high, perhaps it’s because the reservoir has expanded upstream to include this area of the Weaselhead. We found two geocaches today that were not “plain jane”. This container was a block styrofoam shell over a Ziploc container. 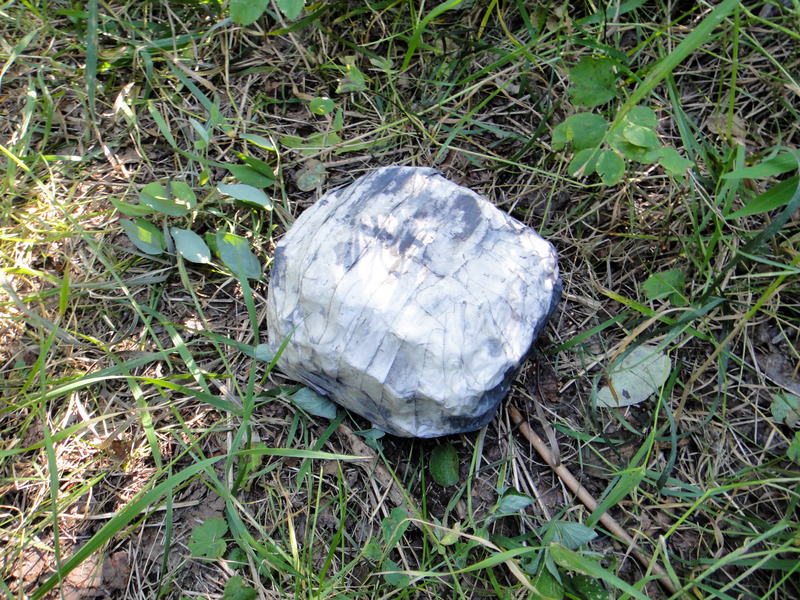 The cache owner used white hockey tape over the styrofoam and then used grey paint to create a fake rock. The cache was placed earlier this month, so only time will tell whether this type of container can withstand Calgary’s winter temperatures / weather. The other noteworthy container was a lock ‘n’ lock containing a waterproof match container for the log sheet. Most of the space in the lock ‘n’ lock was taken up with a little diorama that represented the cache name. The surprising contents brought a smile! Mrs. GeoK seems to have more flat tires than the rest of the family combined. A few days after riding the 24 Hours of Adrenalin course at the Canmore Nordic Centre, the rear tire on her mountain bike was absolutely flat, requiring a tube replacement. Today, C and Mr. GeoK pumped more air into the rear tire of her road bike – twice! We’ll be keeping an eye on this one. C suspects slow leak. 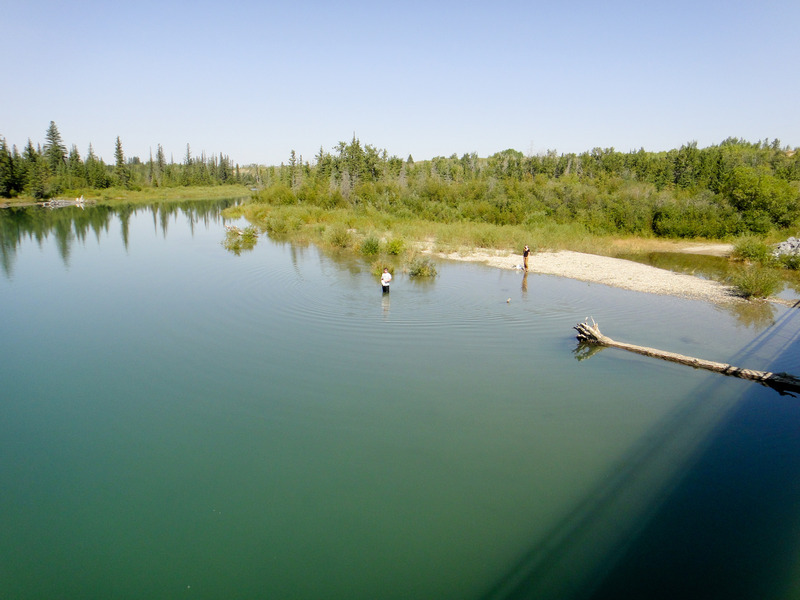 On our return ride through the Weaselhead, we came across a couple of City of Calgary Waterworks personnel collecting water samples for quality testing. It was such a warm day they waded right into the water with jugs and bottles to collect the water samples. When asked, they said they collect water samples from this location on a regular basis. And they agreed the water level is much higher than usual at this time of year. All-in-all it was a good day to be out for some exercise, to find a few geocaches and to enjoy the sunshine. And the really good news – no sore muscles today!